3.6 x 2.5 x 2.1 cm. A wellcrystallized unidentified amphibole group mineral. This is a very 3-dimensional, doubly-terminated, complete all-around, sharp crystal nicely accented with a bit of feldspar on one side. 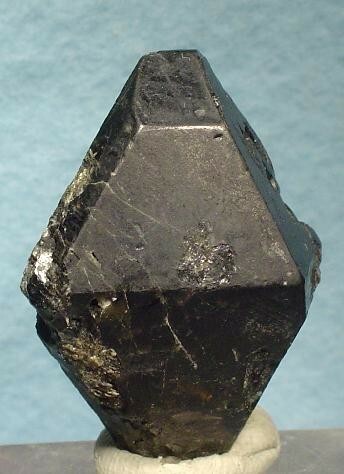 The lustrous, black crystal is sharply terminated at the top and looks like an octahedron. The basal termination is cleaved and it’s hard to tell, if the upper termination is totally complete. From a very uncommon Madagascar locale - Tsilamaha.